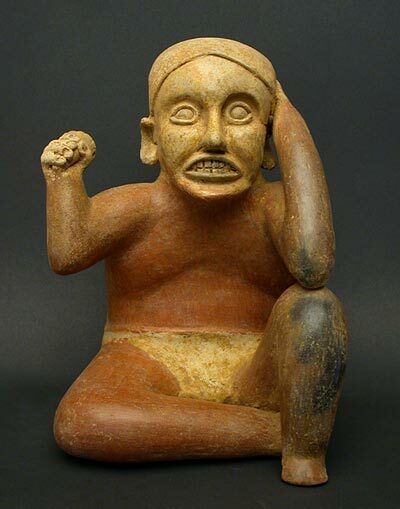 The "rattle man" is a very expressive figure, undoubtedly representing a shaman. The details are superb and uniquely modeled. He is truly polychrome, with the gray-white Ameca treatment of the head, hands and garment, against a deep red torso, arms, and legs. The rattle has a vertically incised decorative design with two pierced holes on one side, and one on the other side. Additional vents are in the well-modeled ears. The lips are protruding around the well-defined teeth as if defining a gesture. Remains of black paint accentuate the eyeballs, and remains of red are upon the headpiece. There is a black firing cloud upon the true left knee and the tip of the elbow. There is old red pigment on the chin and lower jaw, perhaps to accentuate the contrast on the facial plane. There is no evidence of cracks, breaks, repairs, restorations, or new paint.